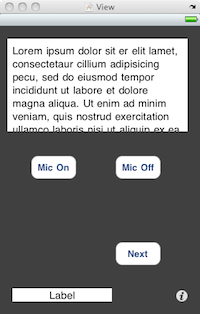 When I design an iPhone app I tend to use Interface Builder. 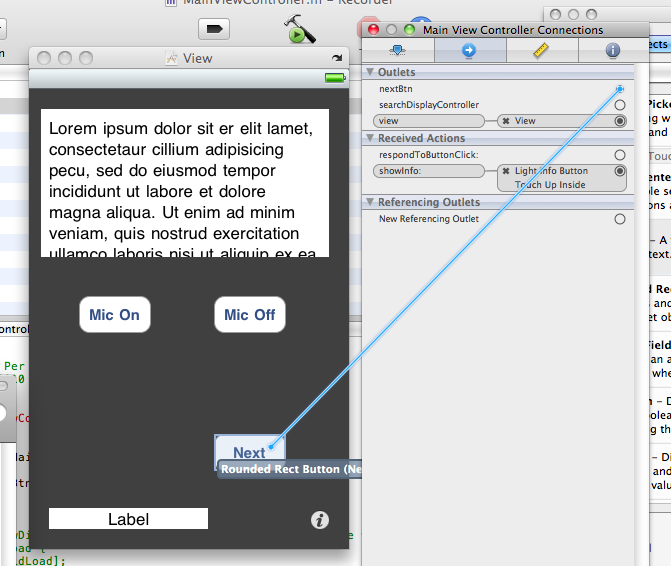 However, I always forget how to actually connect the widgets (buttons, labels and so on) in Interface Builder to variables I can reference in my Objective-C code in Xcode. Hence this post. Note that this is one approach, there are several others. However, the procedure I describe below is beneficial as it is quite simple, yet usually all that is required. 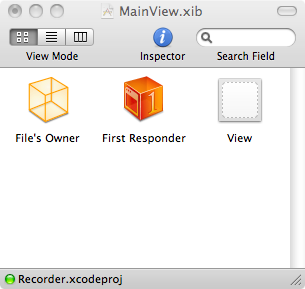 The way I usually do it is to simply start a new project, open the Resources tab in the Groups & Files sidebar, and then double-click on a pre-generated Interface Builder XIB file (for example, MainView.xib). OK. So we have designed a user interface using Interface Builder. Now, how do we access all these widgets in our code? Here I will describe how we are going to connect the button labeled Next in the above screen capture to a variable named nextBtn. The code above prints out a message to the console whenever the button labeled Next is pressed by the user (to view the console press Shift-Command-R). Choose respondToButtonClick:. 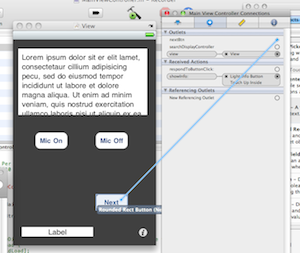 Then save your interface design in Interface Builder. Voila! You can now access the button labeled Next using the nextBtn instance variable in your code. Further, whenever a user presses this button, your method respondToButtonClick: will be invoked and execute any custom code you insert here. The above procedure used a single button for illustration purposes. 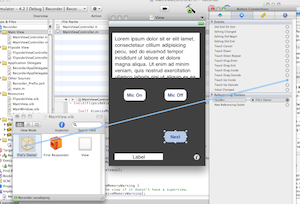 However, this procedure generalizes to all widgets and actions supported by Interface Builder. Have fun! 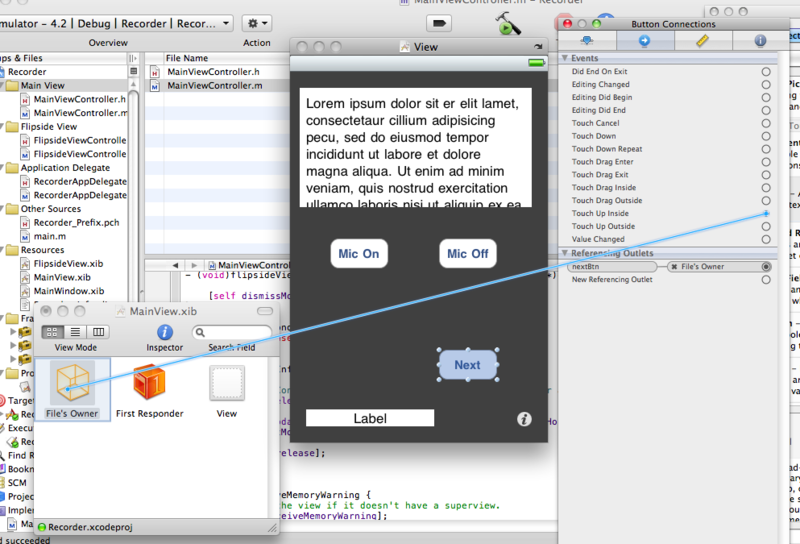 For more information, check out Apple’s own documentation on integrating Interface Builder with Xcode. Using Objective-C to teach object-oriented programming? 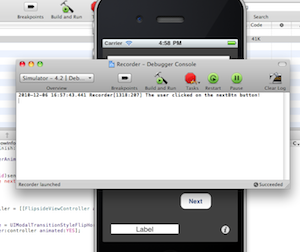 I am programming in Objective-C right now. It is an interesting programming language, essentially a smaller and simpler alternative to C++. However, unlike C++, Objective-C is a strict superset of ANSI C, which means any valid C code can be compiled by an Objective-C compiler, something that a C++ compiler cannot guarantee (for instance, the need to cast void-pointers is different in C and C++). What Objective-C does is add additional well-needed abstractions to ANSI C, such as classes, interfaces and inheritance. I have to admit, coming from mostly C and Java programming, I was initially annoyed by the Smalltalk-inspired syntax (and I’m still not convinced it makes any sense). 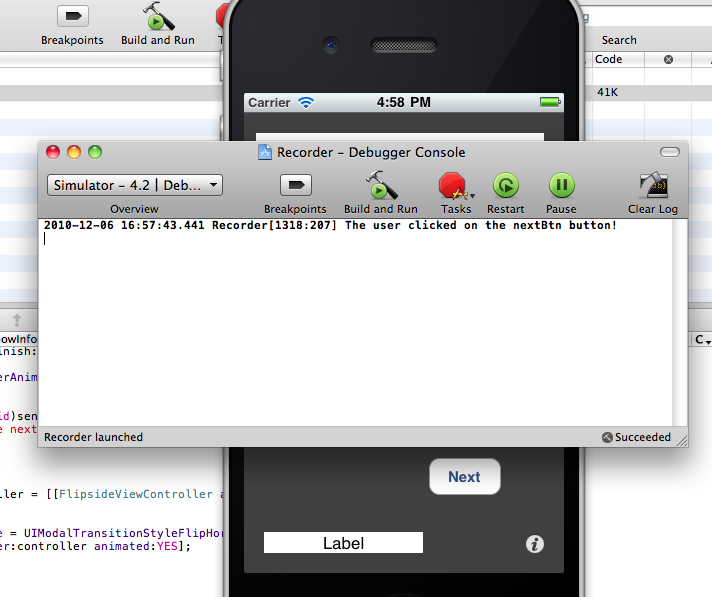 However, I am starting to think that Objective-C might be a good teaching language for an ambitious programming class. Unlike Java and C++, Objective-C’s syntax clearly differentiates between standard function calls and instance method invocations (message expressions). The syntax also differentiates between method declarations and function declarations. The theory is that by having distinct syntax for these and other aspects of the programming language the learner is forced to conceptualize the differences. Syntax is enforced by the compiler and conceptual misunderstandings will lead to compilation errors that the learner has to correct. In other words, conceptual misunderstandings are explicitly pointed out to the learner by the compiler. If the learner does not satisfy the compiler the program won’t compile, let alone run. For example, the Objective-C syntax makes it impossible to call an instance method and not realize that this is message passing and not a static function invocation. Another potential advantage of using Objective-C as a teaching language is that it is somewhere in the middle between Java and C++. It is closer to the hardware than Java. For instance, when an object is created in Objective-C, the idiom is to first explicitly allocate memory for it and thereafter initialize it (e.g. 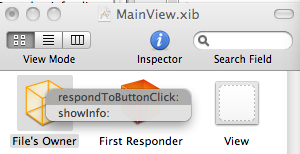 the expression UIButton *button = [[UIButton alloc] init]; first allocates memory for a structure to represent the button, and then initializes it). This first step of allocation and memory management is hidden for Java programmers. However, computer science students obviously need to understand memory management. Yet Objective-C is not as convoluted as C++. For instance, it doesn’t have operator overloading, templates and multiple inheritance. Hence it is not too daunting for the beginning programmer. This tutorial succinctly highlights the differences between Objective C and C.